Wouldn't it be nice if all those hours kids spent glued to their PlayStation 3, Xbox 360 or Nintendo DS video games actually resulted in something tangible? Better grades, perhaps? Improved concentration? Superior driving skills? Over the past decade, many studies and news media reports have suggested that action video games such as Medal of Honor or Unreal Tournament improve a variety of perceptual and cognitive abilities. But in a paper published this week in the journal Frontiers in Psychology, Walter Boot, an assistant professor in Florida State University's Department of Psychology, critically reevaluates those claims. Together with FSU psychology doctoral student Daniel Blakely and University of Illinois collaborator Daniel Simons, Boot lays out what he believes is a persuasive argument that much of the work done over the past decade demonstrating the benefits of video game play is fundamentally flawed. "Despite the hype, in reality, there is little solid evidence that games enhance cognition at all," he said. The authors make the case that a number of influential studies supporting the superior skills of action gamers suffer from a host of methodological flaws. Many of those studies compared the cognitive skills of frequent gamers to non-gamers and found gamers to be superior. However, Boot and his coauthors point out that this doesn't necessarily mean that their game experience caused better perceptual and cognitive abilities. It could be that individuals who have the abilities required to be successful gamers are simply drawn to gaming. 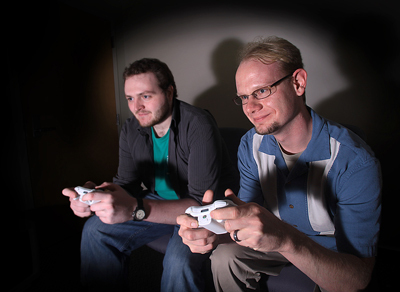 Researchers looking for cognitive differences between expert and novice gamers often recruit research participants by circulating ads on college campuses seeking "expert" video game players. That wording alone, Boot argues, "lets participants know how researchers expect them to perform on challenging, often game-like computer tests of cognition." Media reports on the superior skills of gamers heighten gamers' awareness of these expectations. Even studies in which non-gamers are trained to play action video games have their own problems, often in the form of weak control groups, according to Boot and his coauthors. Boot, who grew up playing video games, said at first he was excited about research that claimed playing action video games could enhance basic measures of attention. He and his fellow researchers conducted their own video-game training study to determine what other abilities might improve following video game play, but they were unable to replicate the training benefits found in earlier studies. "The idea that video games could enhance cognition was exciting because it represented one of the few cases in which cognitive training enhanced abilities that weren't directly practiced," Boot said. "But we found no benefits of video game training." Not only did some of his studies fail to replicate those earlier findings, but "no study has yet met the 'gold standard' methods necessary in intervention studies of this sort." In fact, certain methodological problems appeared again and again in the studies that Boot and Blakely and reviewed. Even more important than identifying flaws of previous studies, Blakely said, their new paper outlines a series of best practices for researchers who want definitive answers on the potential benefits of video game play. Boot and Blakely haven't entirely written off video games as a way to boost perceptual and cognitive abilities; in fact, they're still open to the possibility. But before they start recommending video game interventions as a means to improve perception and cognition for kids, adults and senior citizens, they say more evidence is necessary. "If people are playing games to improve their cognition, they may be wasting their time," Boot said. "Play games because you enjoy them, not because they could boost your brain power." For more information, contact Boot at (850) 645-8734 or wboot@fsu.edu. "The idea that video games could enhance cognition was exciting because it represented one of the few cases in which cognitive training enhanced abilities that weren't directly practiced."